Adventures with a Salmon rod: 2 Sea Trout and a Hat! I had been watching the river levels over the last few days looking forward to getting on the river for a few hours with my mate Tony. Not surprisingly heavy rain on Thursday brought the river levels up again! The fluctuating river levels are completely out of character for this time of year on the Frome. After a phone call the night before to discuss if it was worth going we decided that there may be a few Sea Trout about so we'd give it a go. We arrived to find a very strong wind blowing down the valley but encouragingly, the water was not overly coloured and it looked just right for the Sea Trout. As we fished up the beat we expected the shallower runs to produce if anywhere would. As we approached the "hot spot" Tony shouted that he was in. As soon as she realised what was going on Poppy decided to swim across the river to give him a hand. After a bit of shouting i convinced her that she should get out! after a good scrap Tony landed a lovely fresh fish - a good start to the day and the first decent Sea Trout either of us had had so far this year. We fished on for a while with no other offers and decided to head back to the hut. I left shortly after and decided to pop back after lunch for an hour with the dog. I fished up from the bottom footbridge and was hoping I might find a taking fish somewhere. 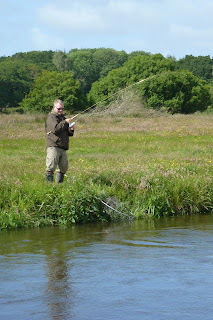 As I fished up towards the Sea Trout pool I put out a cast into the slack water on the inside of the bend below which was almost immediately hit by a nice fish. 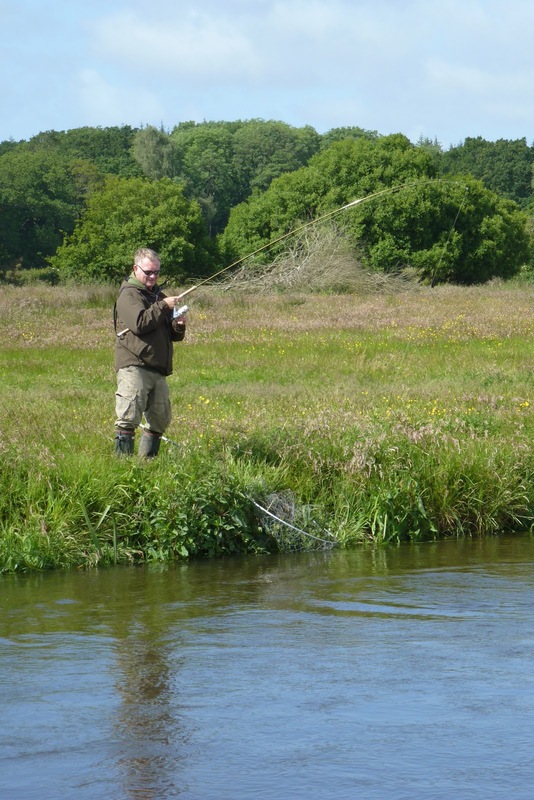 I realised it was a Sea Trout almost immediately as it launched itself high into the air. Poppy stopped sniffing the large fresh cow pat she had found, she was ready to launch herself into the river. I told her to wait and amazingly she did! After a good scrap I landed a lovely fresh fish of about 4 1/2lb. As I fished up to the hot spot the wind caught my lucky cap and blew it right into the middle of the river and was drifting down stream fast. Gutted, my season was to be doomed without it! After a couple of casts i managed to snag my cap with the spinner and set the hooks, relieved, i started to 'play' my cap, it put up a spirited fight but eventually the smooth drag and the vast reserves of power in the rod blank won the day. As I landed the hat poppy looked on, probably thinking 'What a prat' She was right of course!